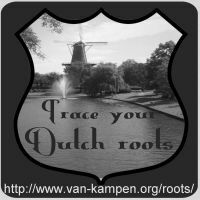 The Dutch civil register is a register that lists all births, deaths and marriages that took place in The Netherlands since 1811. Most marriages from the period 1811-1922 are now in Genlias (notable exceptions are the marriages from the three largest cities, Amsterdam, Rotterdam and The Hague). You may search with just a surname, but usually you will find hundreds of records. Better restrict the number of results by filling in some other fields. Gerrit and Maria van Nederynen arrived with their six children, aged 6 to 15, at Ellis Island on 5 August 1907. Their last residence was Hilversum, Holland. Contact address in the Netherlands was Maria's brother Cornelis van Kampen - we may therefore assume Maria's maiden name was van Kampen. Press search, and wait for the search results to appear. In the list of search results, select the civil marriage for Gerrit van Nederijnen. And there it is: The marriage listing for Gerrit van Nederijnen, 28, from Harderwijk, son of Gijsbartus van Nederijnen and Geertruida Petronella Jansen, and Maria van Kampen, 27, from Hilversum, daughter of Cornelis van Kampen and Gerritje de Rooij. The marriages of the respective parents and the birth of Gerrit are also on Genlias. Finding them is left as an exercise for the reader. Let me know if the information provided was helpful, or whether it could be improved.